Ralph Hill was selected to design and build the renovation to this home that would bring its systems up to date as well as connect the main living areas with the outdoors. 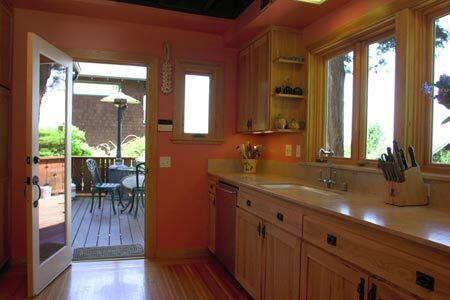 The design we developed integrated the new kitchen with the back yard, which enabled us to build a family room where the original kitchen was – all connected to a wonderful deck under the redwood trees. 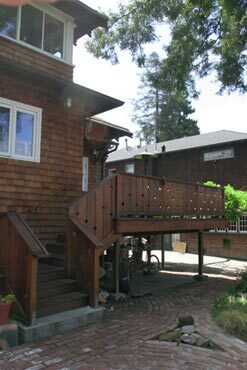 To our client’s delight we were able to re-use most of the old redwood salvaged from the demolition of the old sunroom and porch. We also installed a new foundation and drainage system as well as upgrading the plumbing and electrical systems for the whole house. 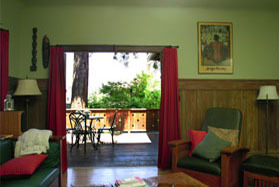 You can see the French doors we installed, opening up the living room to the deck and the serenity of the back yard. The tree you see is a 100 foot tall redwood planted about 90 years ago when the house was built. A primary goal of ours was to preserve this beautiful tree throughout the project. We relocated the kitchen from the dark north side of the house to the sunny western side, replacing a small underused sunroom. 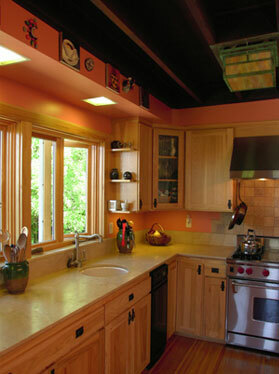 The space was enlarged to further integrate the kitchen into its natural surroundings and bring light in. 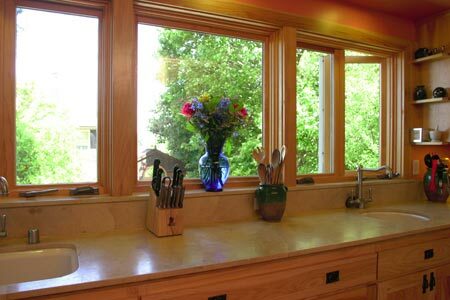 Here you can see the long sandstone counter work area and with a small vegetable prep sink. Note the exposed beam ceiling and custom made verdigris copper and stained glass light fixture. Taking full advantage of the sunlight and natural surroundings, we installed this ten foot wide window above the main counter. Note the open end-shelves which provide great storage for everyday cooking tools. The Italian tile backsplash beautifully integrates with the strong grain pattern and colors of the hickory cabinets. 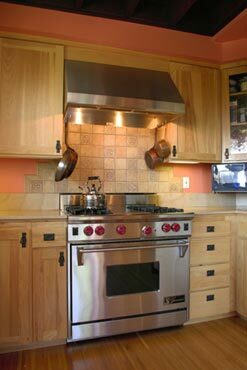 The room is capped off with the stainless steel range and hood on the refinished floors. Connecting the kitchen with the outside was a key element in our design. Here you can see the access through a glass door to a sunny deck that we built. Here you can see the flow from the new deck to the garage via brick we salvaged from the original foundation. We brought an interesting touch of elegance by carving a diamond cutout design into the redwood railing. All the vertical boards of the deck railing are from redwood salvaged from the deconstruction of the sunroom.